Create “good flow”. Instead of thinking in terms of square footage added, think about creating good room relationships. Creating “good flow” isn’t about having defined circulation paths or hallways in a house. It’s about eliminating the need for hallways with good room relationships. 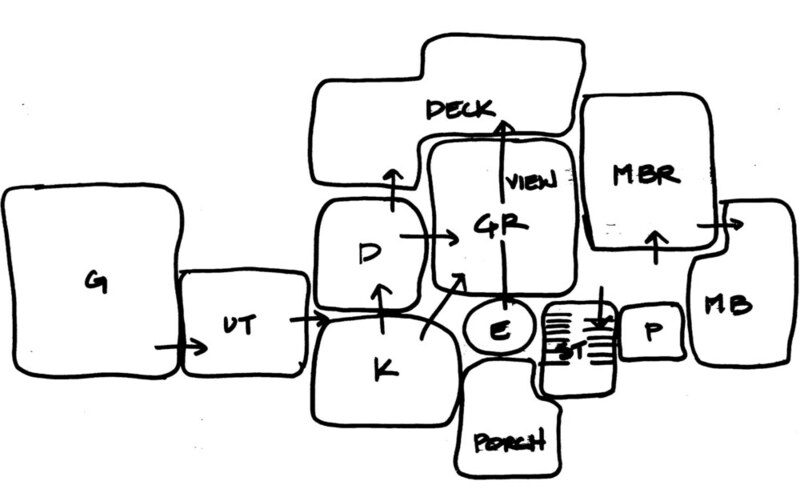 Most architects start the design process by using bubble diagrams to map the locations of rooms and relationships between them. Once that has been mapped out, you can move forward with the details. Balance and proportion. How does an addition affect the rest of the house? Will one room be huge, while the rest of the house is small and cramped? When possible use some of the new space to create openness and loosen up the existing spaces. Squarer rooms feel the best and furnish the easier than long, narrow rooms. Ceiling heights should increase with the size of the room, and if possible, ceiling heights should vary in a home. Furnish the spaces in your sketches. Showing the location and size of furniture groupings in your sketches will help get properly sized and proportioned rooms. Seeing furniture in a space will also help you define how you’ll use the spaces. Keep in mind that although a 3’ circulation space between furniture looks fine on a plan, it’s more room than we normally use in real life. Contain the addition. Removing an exterior wall is a complicated and expensive proposition. The existing roof and floors are supported by the exterior walls. The most cost effective addition adds the most area while removing the least exterior wall. Many times I have talked to people who want just a little more space in every room of their house. This type of addition isn’t cost effective and many times doesn’t solve the real problems of the house. While adding a narrow strip on one side of a house isn’t advisable, adding simultaneously to two sides and removing an existing corner is extremely difficult and rarely a good course to follow.